Actual Size: 31 feet long, 10 feet wide, 12 feet high! Age Group: Children under 12 years. Rainbow Combo 4in1 with basketball hoop Jump, Climb, And Slide Over The Rainbow! This four in one gives you more bounce for your buck! The Rainbow Slide unit has a good size jumping area, a two lane 'rock climbing' hill with awesome, safe, sliding down the other side! There is also a built in basketball hoop on the outside end to shoot some hoops in the four in one while you work up a sweat! The Rainbow Slide unit is: 31 feet long, 10 feet wide, 12 feet high! This awesome party pleaser rents as a 4N1 (with basketball hoop) for the entire day! We recommend two people to supervise this unit, one person at both ends. Go with the fully enclosed (for shade and so no one can jump off the slide) Rainbow Combo Slide for an incredible impression and a unit that coordinates with every party theme! Seasonally the Rainbow Combo can also be used as a water slide for no extra cost! Children 3 1/2 through 12 years can enjoy this combo unit. WATER slide 4N1 Combo - jump, two climb 'rock wall' water slide, and basketball hoop on the outside - do it all or just what you want to do!Rainbow Combo is a Jump, Rock Wall and Slide all in one! It can be a water slide and kids can play basketball too. We encourage this for all children 5-8 years old for the best party ever! 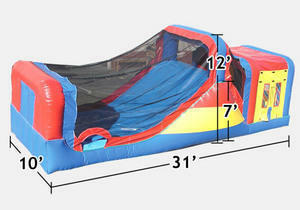 It is also suitable for children 10 and up to 12 because of its duel purpose jump and water slide. This, The Caterpillar, and the Train Combo are the only units that combine a jump house and water slide. The netting keeps children safely inside and helps keep the sun from stinging their skin! This is a perfect unit for the 'Best Party Ever!" Last permitted and inspected 2015. Needs netting repair. Good unit years of use left.